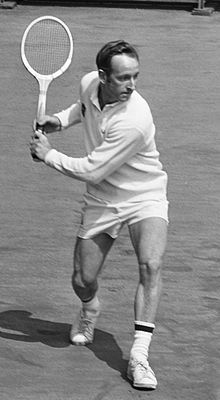 This is a list of the main career statistics of Australian former tennis player Rod Laver whose playing career ran from 1956 until 1977. He played as an amateur from 1956 until the end of 1962 when he joined Jack Kramer's professional circuit. As a professional he was banned from playing the Grand Slam tournaments as well as other tournaments organized by the national associations of the International Lawn Tennis Federation (ILTF). In 1968, with the advent of the Open Era, the distinction between amateurs and professionals disappeared and Laver was again able to compete in most[a] Grand Slam events until the end of his career in 1977. During his career he won eleven Grand Slam tournaments, nine Pro Slam tournaments and five Davis Cup titles. Laver joined Professional tennis in 1963 and was unable to compete in the Grand Slams until the start of the Open Era at the 1968 French Open. Including 6 listed by the ATP website. 1. ? March 1956 Queensland Metropolitan Brisbane ? ? ? Including 46 listed by the ATP website. This list of 200 singles titles from 1956 through 1976 may be incomplete. International Tennis Federation (1970). BP Yearbook of World Tennis 1970. London. Edited by Barrett, John. International Tennis Federation (1971). World of Tennis '71. London. Edited by Barrett, John. International Tennis Federation (1972). World of Tennis '72. London. Edited by Barrett, John. International Tennis Federation (1973). World of Tennis '73. London. Edited by Barrett, John. International Tennis Federation (1974). World of Tennis '74. London. Edited by Barrett, John. International Tennis Federation (1975). World of Tennis '75. London. Edited by Barrett, John. International Tennis Federation (1976). World of Tennis '76. London. Edited by Barrett, John. McCauley, Joe (2003). The History of Professional Tennis. London. Sutter, Michel (1992). Vainqueurs-Winners 1946–1991. Paris. (forewords by Arthur Ashe and Mark Miles). As listed on the website of the Association of Tennis Professionals. Laver won 16 out of 20 Davis Cup singles matches and all four of his doubles. Laver was a member of the victorious Australian Davis Cup teams in 1959, 1960, 1961, 1962 and 1973. ^ Power struggles between the ILTF and the commercial promoters National Tennis League (NTL) and World Championship Tennis (WCT) resulted in Laver missing a number of Grand Slam tournaments during the early 1970s. ^ The final was postponed due to rain and as the players had to leave for England to play tournaments, including Wimbledon, it was rescheduled and played on 10 September. ^ McKelvie, Roy (1986). The Queen's Club Story, 1886-1986. London: Stanley Paul. p. 148. ISBN 0091660602. ^ "Corpus Christi Caller, Oct 3, 1968". Retrieved 13 July 2015. ^ "Memorial Gym Hosted 1968 Pro Tennis". Retrieved 13 July 2015. ^ "Laver at the ATP". Retrieved 23 April 2014. This page was last edited on 21 January 2019, at 00:01 (UTC).